I visited Jericho today that is considered Palestine. How is the region considered Palestine? Entering Jericho you have to drive through an Israeli checkpoint, half a kilometer we pass a checkpoint of the Palestinian police/authority, they gave us a piece of candy as a welcome gesture. Entering Jericho you view the Palestinian flag, their cars have green license plates and yellow taxis, which makes it easily observable who lives in Israel because of the yellow license plates, although all the Israeli cars that enter the West Bank are Arabs; the Israelis are too fearful to enter a Palestinian town or city. The Israelis can drive anywhere; the Palestinians cannot bring their car into Israel, and can only enter with a visa—no visa, no entry into Israel. Within the West Bank the energy is of a different country except for using the Israeli Shekel. 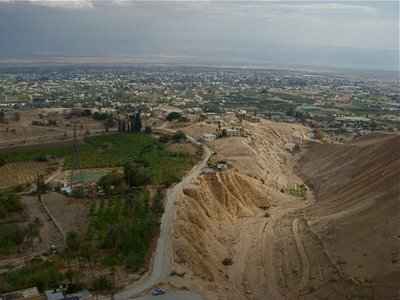 Jericho is one of the oldest continually inhabited areas in the world and one of the lowest situated at 260 meters below sea level. 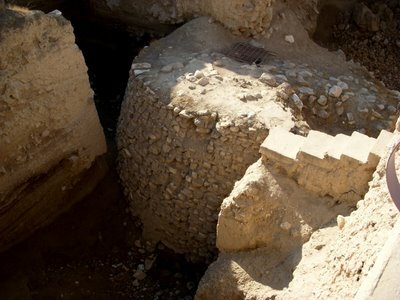 The Tel Es-Sultan (the picture below) is what remains of the worlds original civilization, the stairs dates back 7000 years. 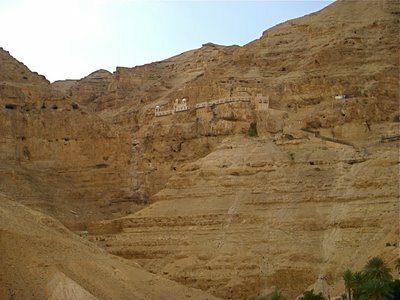 The first picture posted is the Monastery of the Qurantul that marks the cave Jesus was tested after the 40 day fast. The structure and engineering feat are as astounding as the Monastery in Turkey just north of Trazbon. Talking to a few Palestinians in Jericho, one man wanted to visit Jordan just across the river—he wasn’t allowed—the Israeli border said No. For him to travel to Ramallah he will be stopped at the checkpoints and questioned. Why is he going, what is in Ramallah, what is the purpose? He said it is easier just to stay in Jericho. Keep in mind these Israeli checkpoints are east of the Barrier Wall in the West Bank. Tourism is what keeps Jericho alive and the help of the UN. As a humanitarian relief, the UN is of help; however, as an organization that creates international laws that countries ignore, the organization is useless since the UN is unable to enforce an international law. In Jericho sits a tree that is said to be over 2000 years old. The tree of Zacchaeus got its fame from the story of the rich-but-short person who climbed the tree to meet Jesus; Zacchaeus invited Jesus into his home. On the way, back we stopped at Bethany (Al-Eizarriya) where the tomb of Lazarus resides whom Jesus resurrected. Bethany is in the West Bank. The Barrier Wall divides Bethany from the Mount of Olives. The hill next to Bethany is Abu Dis. Driving out of Bethany to the highway there is this huge Israeli settlement called Ma’ale Adummim. Ma’ale Adummim is situated on a high hill (like all the settlements) just across from Al-Eizarriya, though east of the wall. The road divides the two towns, and only one road entered the settlement. All the settlements are surrounded with fencing and barbwire. 3. Among the Jews, a theory, plan, or movement for colonizing their own race in Palestine, the land of Zion, or, if that is impracticable, elsewhere, either for religious or nationalizing purposes;– called also Zion movement. Viewing the intention of the Israeli Government of how the West Bank is carved and the settlements that are allowed to exist proves a point—power corrupts, and egocentric intentions are pursued despite the historical events of their ancestors. Yet, many common Israelis are honest-hearted, and good people that have ascertained from the historical events of their heritage. The disheartening vision for the common Israeli is they do comprehend that other countries dislike Israel. Moreover, the War in Gaza with Women and Children dying and injured enhances the loathing of a third party. The Israelis that travel after serving in the army understands this fact of aversion toward their country. An unfortunate fact is that many people connect the person to the actions of the government, instead of viewing the inner person—and that is a mistake. Next post: Traveling the North.